THIS IS WAR gets set for a broadcast, using one of the biggest sound-effect batteries ever used. At the mike are Fredric March and Lieutenant Douglas Fairbanks Jr. 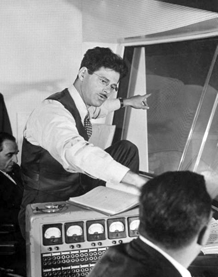 In the glassed-in control booth at the back is Norman Corwin, director and guiding genius. Scheduled originally for 13 programs, This Is War is so good that another 13 weeks are being considered. "During the past few months, the radio networks sold more "Time," i.e., took in more advertising revenues, than they had in any comparable period of their lush young life. But soon revenue will begin to fall off. War is bringing an end to radio's gilded era. All things considered, this seems a good thing. There is plenty that is fine and honest about radio. It has brought plenty of pleasure and education to the owners of 56,000,000 radio sets. But radio has not lived up to its prospects or expectations. It has aimed too much at the lowest common denominator of popular taste. Radio's excuse is that it gives the people what they want. Even if this were a good excuse, it doesn't make radio sound any better. War has thrown new problems at radio--of presenting fact and propaganda, of keeping commercialism and patriotism decently separated, of informing and stimulating the public. Many of radio's war jokes have been lamentable, many of its war programs hysterical. But some have been fine. Standing above most is This Is War, a program by famous writers over all four networks. 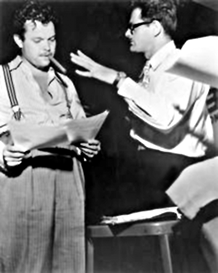 Much of its excellence derives from the direction of Norman Corwin, who at 32 is radio's top dramatic genius. A former newspaper man, Corwin made himself famous by writing and directing plays for Columbia Broadcasting. His shrewd and eloquent combination of mockery and poetry has set the style for a fresh new school of radio dramatists." Radio icon Norman Corwin has created some of Radio, Television, Stage and Film's most innovative, poignant, thought-provoking dramatizations in American Radio history, and over a continuing seventy-five year career. Beginning with The Columbia Network's series of ground-breaking Radio productions, The Columbia Workshop, Norman Corwin was at the forefront of experimental Radio over the eleven year run of CBS' various Columbia Presents series'. As each new series aired, anticipation of Corwin's next project would become even more eagerly anticipated. 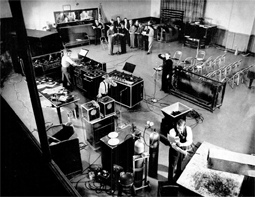 Corwin's ground-breaking productions attracted Radio's brightest, most talented performers and technicians, including Deems Taylor, Bernard Rogers, Lyn Murray, Bernard Herrmann, Johnny Green, Alexander Semmler, and Maurice Goldman. Corwin was basically given his head to develop whichever new production that took his interest. Corwin was rarely preachy, with the possible exception of topics in which Corwin himself was most personally invested, and invariably wove an amazingly detailed tapestry for each of his productions. Using that tapestry as a backdrop, Corwin would then overlay his key points and critiques against that backdrop. The technique provided the listener both a visual and aural image against which to compare and contrast the points Corwin attempted to highlight, dramatize, or resolve. Corwin's subjects spanned the gamut of human interaction, development, scientific aspiration, and political interaction--on a global scale. Given the often sensitive or controversial subject matter Corwin chose over the years, it's a tribute to his creativity and direction that his productions engendered almost univeral interest and admiration from supporters and critics alike. Between 1941 and 1954, continued retrospectives of Corwin's most effective dramatizations surfaced during critical junctures of America's cultural and popular evolution, especially the key years following the onset of The Atomic Age which dramatically affected the balance of world power and ideology. Indeed, Corwin's social dramatizations and commentaries were so effective that verbatim retrospectives of his Radio broadcasts resurfaced in the 1970s, 1980s and 1990s. Corwin's universal appeal is touching even more of an audience as the World enters the 21st Century and finds it beset with a chillingly reminiscent replay of many of the social, economic, religious, war-making, fear-mongering, and political tragedies that plaqued the first half of the 2oth Century. 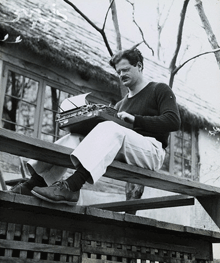 National Public Radio has already undertaken several retrospectives of Corwin's body of work and HBO's brilliant winner of the 2005 Oscar® for Best Documentary Short Subject, A Note of Triumph: The Golden Age of Norman Corwin, also celebrates the career of America's "poet laureate of radio drama." Corwin's brilliant, sensitive observations on global society are as accurate today as they were when they were first broadcast. All the more reason to give them another listen--and learn from Corwin's prophetic, descriptive lessons now that we find ourselves in need of them yet again. In 1935, the Federal Communication Commission (FCC) directed the formation of the Federal Radio Education Committee, or FREC. The then U.S. Commissioner of Education, John W. Studebaker, served as the Committee's first chairman. With funding volunteered by Radio networks, suppliers and foundation donors, the Committee undertook several national conventions, ordered studies of educational programming over Radio, and published various newsletters and reports from their findings. With the advent of War, the FREC was the only pre-existing consultative body then available to help assess the viability of patriotic messaging, education, or targeted propaganda over domestic Radio. There's was clearly a need for a government-sponsored office for coordinating Homefront messaging throughout the war, but the United States Office of War Information (O.W.I.) wouldn't be established until June 1942. And indeed, once the O.W.I. was officially established, the FREC returned to it's previous studies and reporting. It's all the more remarkable that the FREC managed to coordinate and produce This Is War, in the first place. 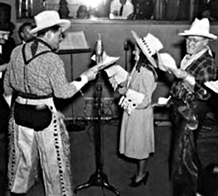 Though only in a rudimentary official capacity, the Commissioner of Education, pressed the FREC into service to corral the four major networks together to produce a series of programs--both educational and patriotic--to explain America's progress, resolve, and challenges as it entered a World War on two hemispheres. This Is War unites all major networks for 13 historic weeks. December 7, 1941 ended the great isolationism debates that had consumed so much of America's political and legistlative agenda between 1937 and 1941. The attacks on Pearl Harbor, The Phlippines, and American protectorates across the Pacific Ocean rivetted the nation into action. As the Life magazine article above indicated, an unfortunate side effect of America's entry into World War Two was an immediate expectation by the networks and sponsors alike that the heyday of Radio in America had finally come and gone. Throughout the late 1930s and early 1940s, Radio programming had, indeed, begun pandering to the lowest common denominator. Though American airwaves were ostensibly owned by the entire American public, powerful lobbyists and the networks themselves had submitted petition after petition and bill after bill to allow vastly increasing commercialism over Radio. Though the period also experienced several highly innovative and educational programs, the overwhelming majority of Radio programs were geared specifically to promoting sales of one product or service or another. Daytime 'soap operas' aired around the dial, continually between 8 a.m. and 5:30 p.m. from coast to coast. And 'soap operas' they were, hawking every imaginable cleaning product or personal hygeine product to the predominately female listening audience during that block of programming. 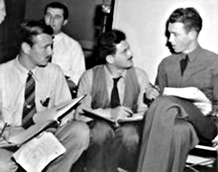 Shortly after December 7, 1941, the United States Commissioner of Education, then the sitting chairperson for the Federal Radio Education Committee, determined that, in the absence of a formal wartime propaganda office, the FREC might very well be the only body--formal or informal--that might be able to be the first to produce a 13-week series of patriotic messages and propaganda for homefront audiences in America and throughout the Allied Forces nations. Titled This Is War, the series sought to frame America's entry into World War II in the context of thirteen, targeted segments of American Society and military infrastructure addressing a wide range topics and homefront-related messages. The charter given the FREC was that the resulting series of broadcasts were to air over all four major American networks of the era-The Blue Network, CBS, MBS and NBC--on the same weekday and time, Saturdays at 6 p.m. C.S.T., and would pool the resources of all four networks in providing technicians, writers and actors to mount the series. 32 yr. old Norman Corwin, already famous for both writing and directing several patriotic and inspiration scripts over the previous 10 years, was tapped to head up the production team, while directing the overall series and wrote nine out of thirteen of the series' scripts. Assisting Corwin with writing duties were Maxwell Anderson, Stephen Vicent Benet, Donald Ogden Stewart, George Faulkner, Philip Wylie and Ranald MacDougall. Run Dates(s)/ Time(s): 42-02-14 to 42-05-09; [All Major Networks]; Thirteen, 30-minute programs; Saturdays, 6:00 p.m.
Lieut. Robert Montgomery, film star now in the navy, will be narrator for "America at War," to be aired at 6. The series is written by Norman Corwin, whose Bill of Rights program a few weeks ago won national acclaim. Lynn Murray, who conducts the orchestra, has written special music, and the Almanac singers will offer one of their satirical songs. Archibald MacLeish will deliver a special message from Pres. Roosevelt. 6 p.m.--This Is War! (WIBA): "The White House and War," with Paul Muni. Fredric March and Lieut. Douglas Fairbanks, Jr., will co-star in "Your Navy," Maxwell Anderson's dramatization of the American naval forces' present tasks and past accomplishments, during "This Is War!" at 6 tonight over WIBA. Don Voorhees will conduct the orchestra in Kurt Weill's special music, and Norman Corwin will direct the play. 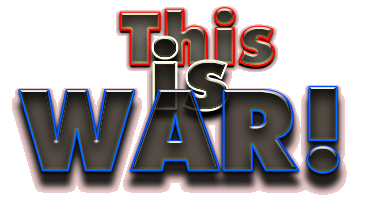 At 6 p.m. through WIBA the fourth "This Is War" program will be aired. Tyrone Power will appear in an original Stephen Vincent Benet story, "Your Army," the facts behind the facts. Thomas Mitchell, movie star, will appear in "United Nations," a drama produced by Norman Corwin, during "This Is War" at 6. Andre Kostelanetz will direct the orchestra. A question most Americans are asking--"What can I do to help win the war?" --will be answered over WIBA at 6 tonight. The reply will be presented in dramatic form during the weekly This Is War! Broadcast. It was written by Donald Ogden Stewart. Four Hollywood and Broadway stars--John Garfield, John Carradine, Henry Hull, and Katherine Locke--will take the leading roles in "This Is War!" over WIBA at 6 tonight. They will appear in "It's in the Works," a dramatization of the nation's production effort written by Norman Corwin. 6 p.m.--This Is War! (WIBA): Lieut. James Stewart in "Your Air Force." 6 p.m.--This Is War! (WIBA): Clifton Fadiman as narrator in "The Enemy." 6 p.m.--This Is War! (WIBA): "Concerning Propaganda," with Donald Crisp as narrator. James Cagney, screen star, will be featured in tonight's "This Is War!" program, to be broadcast at 6 over WIBA. The drama will be "Smith Against the Axis." 6 p.m.--This Is War! (WIBA): "To the Young." 6 p.m.--This Is War! (WIBA): Raymond Massey in "Yours Received and Contents Noted." 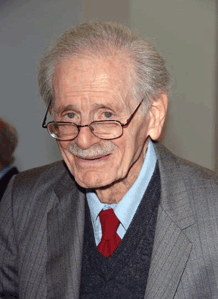 Norman Corwin is approaching one hundred years of age as we prepare this biography. Corwin's father Samuel lived to the age of 112. We can only hope that Samuel's sons will be as long-lived as the father. 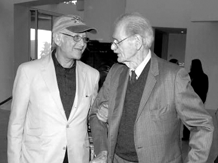 Norman Corwin's continuing legacy of thought-provoking, insightful, brilliantly crafted and prosaic commentary on the human condition have fashioned Norman Corwin into one of American History's greatest writers, visionaries, dramatists and philosophers. Born and raised in East Boston, Corwin was transfixed by Radio as a medium from its initial broad casts. A child prodigy, Corwin was reciting poetry at the age of five, writing full-length stories at the age of seven, was a voracious reader, and an avid classical music proponent since the time he was a child. Reportedly first listening to a makeshift crystal set assembled by his older brother Al, from a cylindrical Quaker Oats box, both brothers soon became avid Radio enthusiasts. Mentored by a devoted high school English teacher, Corwin acquired a life-long interest in poetry, especially that of Keats, Shelley and The Brownings. Upon early graduation from high school, Corwin began working as a journalist at the age of 17, with Massachusetts' Greenfield Recorder, then the Springfield Republican. Covering a variety of local community interest stories, Corwin's efforts covered sporting events--written in iambic pentameter no less, local color activities, movie reviews, and human interest stories. His first exposure to professional Radio broadcasting came with an opportunity to air an interview regarding one of the human interest stories he'd written about. Station WBZA soon needed a newsreader and sought to have the position filled with someone from the local newspaper. Corwin fit the bill perfectly. By 1929 Corwin had fashioned his own broadcast over WBZA, a combination of piano interludes interwoven with Corwin's orginal poetry readings. He called the program Rhymes and Cadences. If this sounds a reminiscent chord, it's instructive to remember that this is how the legendary Orson Welles embarked on his own Radio career, airing a similar format entitled Musical Reveries in 1936. Indeed, the similarities between these two great Radio visionaries is entirely appropriate. We've chronicled Orson Welles' extraordinary career elsewhere, but it's instructive to point out the fascinating series of parallels in the Radio careers of both Radio legends. You may recall that Orson Welles undertook his own wanderlust through the United Kingdom and Europe as a young man. 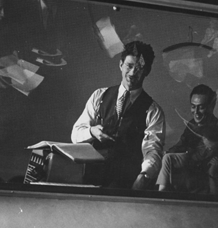 Norman Corwin's exposure to The Continent came in 1931, as he traveled to Europe with his older brother, Emil. The fomenting fascism, social and religious unrest, and political turmoil he witnessed first-hand throughout Europe very much shaped the path Corwin's broadcasting career would take from that point forward. Corwin returned to the U.S. and in 1935 began working as a full-fledged newsman for Radio WLW in Cinncinati, Ohio. Almost immediately encountering one of the Post-Great Depression sore spots first-hand, Corwin learned that any on air reportage of collective bargaining efforts--even organizing for collective bargaining--were grounds for immediate dismissal. He objected to the policy and soon found himself fired after only two weeks on the job. He ultimately took up the issue with the ACLU's backing and eventually got the policy changed--long after he'd departed Cincinnati. The next stop for Corwin was The Big Apple, where he found work as an entry level publicist for 2oth Century-Fox. He soon leveraged his contacts there to yet another proposal for a local poetry/musicale format program to Radio station WQXR. He was soon airing another program similar in format to Rhymes and Cadences, this one cleverly named Poetic License. 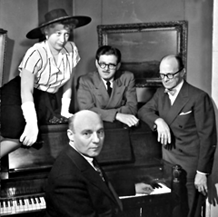 First airing in 1936, Poetic License showcased some of New York's early poetry luminaries, among them Louis Ginsberg, father of legendary Beat poet Allen Ginsberg. The first major network to take an interest in Corwin was NBC, who invited Corwin to appear on RCA's Magic Key, beginning in 1937. NBC was less than impressed and in a moment of fortuitous serendipity for Corwin, released him from his obligation to NBC. Fortuitous, because within a year, a CBS executive would hear one of Corwin's Poetic License broadcasts and offer Corwin a position as Radio Director for $125 a week. Needless to say, that was astounding pay for a young man of that era. So it was that a few days shy of his 28th birthday, Corwin began directing CBS' on-air engineering, writing, and production efforts for the first time. Within a few months he was tapped to direct his first Columbia Workshop experimental drama, The Red Badge of Courage, airing July 9, 1938. In yet another ironic crossed path with Orson Welles, the night of October 31, 1938 found Corwin rehearsing the pilot for a newly proposed poetry program he was developing, tentatively titled Norman Corwin's Words Without Music. 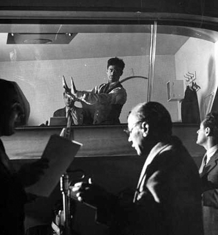 In the studio just below Corwin, none other than Orson Welles and Mercury Theatre of The Air were broadcasting their infamous War of The Worlds broadcast. Oblivious to what was taking place, Corwin reportedly only learned of it once CBS' switchboards began lighting up on every floor. 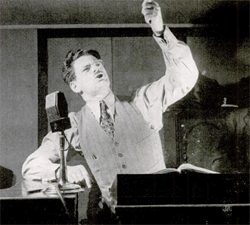 Produced by no less than legendary William N. Robson, Norman Corwin's Words Without Music ultimately aired in production a month later, with Corwin agonizing over the slightest nuance of each broadcast. It was during Corwin's Words Without Musc broadcast of December 25, 1938 that he introduced his famous "The Plot to Overthrow Christmas" to a listening audience, a program that would be repeated over and over again throughout CBS' history. Within a year, Corwin had written, directed, produced and broadcast two of his most enduring masterpieces: The Plot to Overthrow Christmas [Words Without Music] and They Fly Through the Air with The Greatest of Ease [Columbia Workshop]. 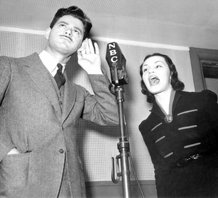 By then helping others develop their own experimental Radio dramas, Corwin found himself directing Earl Robinson's stirring Ballad for Americans, and Lucille Fletcher's biting satire, My Client, Curley. Earl Robinson would go on to collaborate with Corwin on several of his Columbia Presents Corwin productions. Mr. Corwin took most of 1940 to work as a screenwriter for RKO Studios. Unimpressed, Corwin soon realized that he'd had far more artistic freedom back at CBS. So it was that upon returning to CBS, he was offered control of fully six months worth of Columbia Workshop programming. 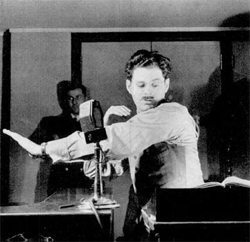 The resulting 26 By Corwin was Norman Corwin's first unbridled artistic opportunity in Broadcast Radio. What followed were 26 weeks worth of Norman Corwin's dramatic passion. Corwin's creativity could be fully unleashed and fully explored for the following 26-week marathon of writing, directing, producing and agonizing over the result. But the agony couldn't last long, since from moments after each broadcast's sign-off, the process would begin anew, with carte blanche and all that a blank piece of paper means to a creative person--both the pros and the cons. In the end, he pulled it off--in spades. 1941 became one of the most triumphant years of Corwin's creative work experience to date. Indeed to this day, several of those twenty-six Corwin efforts have become standalone classics of the Golden Age of Radio. Corwin wrapped up the year in extraordinary fashion with one of Radio History's most stirring paeans to American Democracy ever aired--We Hold These Truths. We Hold These Truths was a multimedia celebration of America's Bill of Rights. The broadcast was heard by the largest single audience in Radio History up to that point. Its timing was absolutely exquisite--indeed, almost prescient, given the life-altering developments of the morning of December 7, 1941. The project wasn't developed as a response to the bombing of Pearl Harbor. Indeed it was still under development and being written by Corwin the afternoon that he first heard the news about the attack. Starring no less than Jimmy Stewart, Edward G. Robinson, Orson Welles, Edward Arnold, Lionel Barrymore, Walter Brennan, Walter Huston, Marjorie Main, Rudy Vallee and Bob Burns, the score was written by legendary composer Bernard Herrmann. And almost as a footnote to this remarkable production, FDR himself addressed the country during the production. The Star Spangled Banner was performed by the full New York Philharmonic Orchestra, conducted by no less than Leopold Stokowski himself. The mind reels to imagine a Radio broadcast with that much prestigious talent during one airing today. Call it 1941's version of 'We Are The Children'. That's about what it amounted to. The costs alone today would be astronomical. We Hold These Truths holds up just as well today. I have yet to share an airing of my recording of We Hold These Truths with anyone without evoking a remarkable reaction from them--young, old, and every age in between. It's quite simply one of the most stirring, patriotic, genuinely moving reminders of what this country has fought to defend for almost 240 years as of this writing. Needless to say, by 1942 Norman Corwin's work was rapidly approaching legendary status. Nor did he shirk from the challenge to pursue even greater triumphs. His broadcasting excellence surmounted even commercial network rivalries. He was commissioned by the Office of War Information to develop the stirring This Is War series which was mandated to air simultaneously over all four major networks. During 1943, Norman Corwin was dispatched to England to cover the War effort from their perspective. A unique joint effort of The BBC and U.S. broadcasters, the amazing recordings Corwin returned with resulted in the wonderfully inspirational An American in England series, showcasing the indomitable spirit of Wartime Great Britain. The resulting series was quite understandably one of the War effort's most inspirational series to that date. As hard as it is to imagine, Corwin's penultimate masterpiece had yet to be produced. I say penultimate, for good reason, as you'll soon discover. . .
With the end of the War in Europe in sight, Corwin undertook to develop an hour-long, live studio observance of the end of War in Europe. 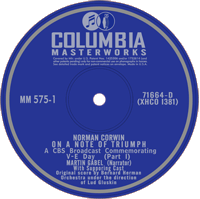 The resulting On A Note of Triumph became Corwin's crowning masterpiece. Again scored by Bernard Herrmann, not only did it set another record for largest simultaneous listening audience, it was pressed as a 78 RPM record for further distribution. The first pressing sold out almost overnight, as did a hardcover print of the script, which became an overnight best-seller in its own right. Both the records and scripts were pressed and published again and again to keep up with the unprecedented demand. Corwin, aided by Orson Welles, rose to the occasion yet again, with even less preparation, as V.J. Day finally--and quite unexpectedly--arrived on 14 August 1945. L'Affaire Gumpert was the Columbia Presents Corwin program that had been scheduled for airing on August 14th. 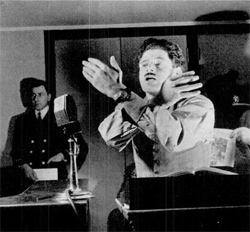 Never one to shirk a challenge, Norman Corwin, with less than eleven hours' notice, threw together the final epitaph on World War II, with a minimal sound track, a single sound effect and only Orson Welles' magnificent voice as his primary artistic tool. And yet, irrespective of the absurd limitations placed on this single, 15-minute program of the run, you see the effort of Radio's two giants, converging to produce a miraculous post-script to the most bloody, expensive, gut-wrenching five years our young Nation had ever experienced. And quite frankly who else could possibly have ever pulled it off but these two geniuses? To this day, one needs to pinch oneself to be reminded of the extraordinary constraints imposed on both Welles and Corwin to pull off Fourteen August at all. And yet they did it. And they could only have done it over Radio. In the final analysis, they did what both their extraordinary backgrounds had prepared them to do--and at the time that their country needed their special individual talents the most. It's beyond prosaic. It was fated. It was beyond Kismet. It was their destiny from the moment each of them separately undertook their first independent Radio broadcasts, each in their own rendition of a mixed poetry/musicale format. The ironies and coincidences are beyond serendipity. They're cosmic. As announced, L'Affaire Gumpert was indeed Corwin's last Columbia Presents Corwin. Anything else would have been post-climactic. What could possibly have topped Fourteen August? The entire nation was sharing a combination of mass delerium and a combined, cathartic sigh of immense relief. It was time to move on. The machinery of War was destined to be scrapped and fashioned back into the plowshares that many of those same machines of War had been manufactured from. And so it was with the two giants of Radio. Each ultimately going their own way again. Each having shared a cosmic moment of catharsis with an entire Nation. What could possibly have topped the emotion of that singular moment of 14 August? There's no question that Norman Corwin, despite his amazing professional triumphs of the World War II years, went on to even greater triumphs for the remander of his storied career. 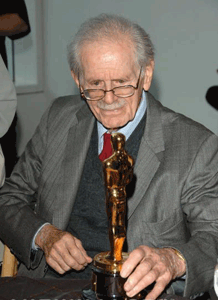 As recently as 2005, he worked tirelessly to help produce and promote 2005's Ocscar winning Documentary Short Subject, On A Note of Triumph: The Golden Age of Norman Corwin. How fitting a tribute, but some might well ask, what took them so long? We love our heroes. And we need our heroes even more today, as we engage in an economic battle for our financial survival. Much the same survival effort Norman Corwin's own parents had to endure while Norman was still in high school. And so we come full circle. Asking even more from our heroes. Hoping they'll remind us why we fight, why we endure, why we never give in to adversity. And why we vainly expect our heroes to always be there for us at the very instant in history when we need them the most. Thank God Norman Corwin isn't going anywhere, anytime soon, bless his heart.